Thanks for the Burger Love on the SouthWest Fusion last week - that Burger Rocked; it will be back. We hope this week's Burger Of The Week will warm you up as well; The SPICY JAZZ - Seasoned Grassfed Angus Patty with roasted red bell peppers & jalapenos and cheddar cheese & jazzy sauce. We will also have our delicious Homemade Dessert Treats and Soups! Don't forget to log on to our site, fritesnmeats.com, via your smartphone as it is now powered by MobileMeteor! The SouthWest Fusion...Seasoned Grassfed Angus Patty, Spicy Guacamole, Pepper Jack Cheese, Applewood-smoked Thick-cut Bacon and Sweet Chili Sauce. Hope everyone had a great Holiday weekend and enjoyed some good football! The Burger Of The Week - The Italian Job...Seasoned Grassfed Angus Patty,Mozarella, Gorgonzola & Parmesan Spread,Applewood-smoked Thick-cut Bacon, & Salsa Verde. We hope everyone is staying warm out there....we are feeling it but our Goods are sure to keep you warm! The Burger Of The Week - BYMARK - Seasoned Grassfed Angus Patty with Brie, sliced grilled mushrooms, Garlicky Lemon Aioli on a Brioche Bun. We hope everyone is all dug out from the snow and enjoyed their Holidays! 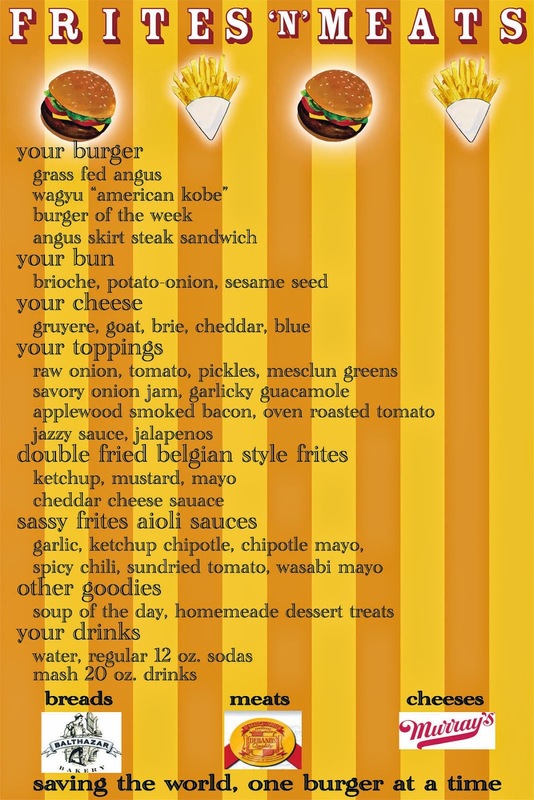 This week we will be giving out free FRS drinks with the purchase of a KOBE Burger and Frites! That's right - a free FRS Drink to help rejuvenate you from the Holidays and all this Snow.